Play your DVDs on a small DVD player for the most versatility in a portable environment. You can choose from a variety of sizes, brands, colors and platforms. Walgreens.com offers DVD players from brands like Sony and Coby. If you are looking to buy a small DVD player for travel, there are many battery-powered options that are compact enough to fit in your purse or briefcase. For under $60, you can buy a miniature DVD player that will play CDs and DVDs, and has two headphone outlets. If you spend over $100, you can get added features such as a swivel screen, a USB/SD slot and a user-friendly graphic interface. A multimedia player is able to play games, DivX videos and MP3 music in addition to DVDs. 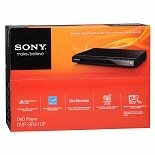 If a travel size DVD player is not what you are looking for, check out our small DVD players that work well in the home. A small size screen can have a built in slot-loading DVD player that is able to play CDs and DVDs. If you are concerned with picture quality, a small screen may be most advantageous. A non-portable video player has an LCD color display able to display high-definition images. The cost of a stationary small DVD player starts at approximately $200.